In life, we’re told to dream big and reach for the stars. Having big aspirations is admirable and inspiring, but when it comes to fitness, especially if you are just embarking on your fitness journey you should take a more calculated approach when setting goals. By setting yourself specific short term goals and a long term goal you are setting yourself up for success rather than failure. Frequently, I speak to people who have decided to turn their lives around and adopt a healthier lifestyle but set themselves a huge short term goal and by doing this, they are really setting themselves up for a fall. For example, If you haven’t exercised for the last 5 years and then decide you want to work out 6 times a week and lose 25 kg in 3 months you are setting yourself a hard/ virtually impossible target. Firstly, you will burn yourself out with the exercise. being sedentary for so long, even a basic cardio and resistance schedule(if devised properly) will test you and leave you feeling sore in places you didn’t think existed due to the fact you have ‘jumped in at the deep end’. Secondly, trying to lose that much weight in such a short space of time is bad for your body. Remember, you are going to need to completely change your diet which is the hardest thing about weight loss for most people. What is your long term goal? . Is it to lose 25kg? is it to compete in a marathon, is it to apply for the cover model of mens health magazine? , is it to compete in a bodybuilding competition? These are examples of long term goals and giving yourself a 12 month period to reach these goals makes it a more achievable target. What is your short term goal? If your long term goal is to lose 25kg, then your short term goal should be working along them lines and be attainable, for example lose 5kg in 3 months and make improvements in cardio fitness and strength. Use things like the beep test and push up tests to measure improvements. Just be honest with yourself, and gradually work towards your goal. Rather than setting a short term goal of ‘I want to run a marathon in 2 weeks’ after little or no exercise, why not set a goal of ‘I want to run 5k without stopping within the next 12 weeks’. 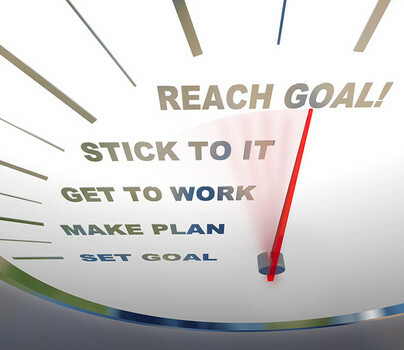 It’s a more achievable goal but will prepare you, and help you to work towards your long term goal. Or another example , ‘ I want to go to the gym everyday’ . There are two main issues with this goal. First, it’s not specific—what activities do you want to do and for how long? After all, just showing up at the gym doesn’t accomplish anything unless you get your body moving. Second, it’s not realistic. I love to work out and even I don’t want to go to the gym every day. Plus, taking a day off here and there helps give your muscles time to rest and repair, and it gives you a break mentally. A better goal to set is ‘ I want to do a resistance training program 3 days per week for 45 minutes to improve my strength’. Far more achievable and it give you chance to swap days around if things come up, it also give your body chance to rest and recover. Also, don’t be afraid to tweak a goal as time goes by. Life happens! Remember, the key to setting yourself up for success is to be realistic, so if you get off track, then review and if needed, adjust your goals and get back into it! I started training with Al to improve my fitness. My vision was to achieve optimum physical and mental strength along with a greater sense of motivation to prepare me for entry into the Australian Defence Force. This entry required me passing their physical assessment. From the beginning of training I have been so impressed with Al’s routine. Workouts are varied and the results are impressive. Well worth checking out. Thanks Al.